With the NoTrax Ultra Mat® you are getting a light weight modular anti-fatigue matting system with molded-in mat connectors for easy on-site custom configurations and longer lengths. 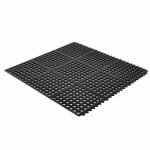 This general purpose floor mat has large holes which provide excellent drainage and the lightweight construction makes it easy to handle. The Ultra Mat® is available in a general purpose or heavy-duty rubber compound depending on your grease and oil protection requirements.